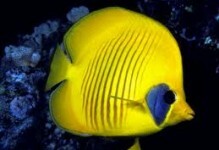 The Saddleback Butterflyfish, also known as the Saddled Butterflyfish or Saddle Butterflyfish, has a large black “saddle” with a white border on the rear upper corner of the body and dorsal fin. 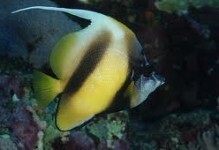 Orange coloration is found on the lower half of its face as well as outlining the black tail. 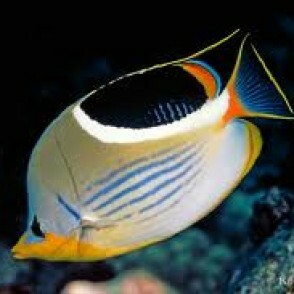 The base color is gray with several blue-gray stripes on the lower body. 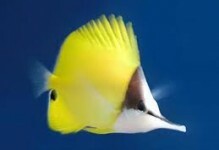 The Saddleback Butterflyfish will do best in a 125 gallon or larger aquarium with plenty of swimming space and well-maintained water quality. 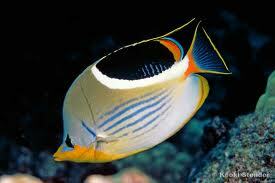 It should not be kept with any of its species unless it is introduced to the aquarium as a male and female pair. 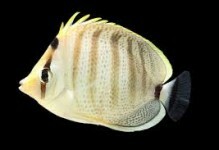 The Saddleback Butterflyfish may be kept in a reef environment but will eat most stony corals, a few soft corals, and invertebrates that inhabit any live rock. Its diet should include a variety of meaty preparations.